The new tariffs would apply to more than 1,000 products, including smartphones, televisions, toys and a range of other products. These penalties could drive up the cost of many products before the crucial holiday shopping season, though it’s unclear how much. President Donald Trump has decided to impose tariffs on $200 billion in Chinese goods, two people briefed on the decision said, one of the most severe economic restrictions ever imposed by a U.S. president. An announcement is expected to come soon, the people said, speaking on condition of anonymity. Trump has ordered aides to set the tariffs on these products at 10 percent. These tariffs are paid by U.S. companies that import the products, though they often pass the costs along to U.S. consumers in the form of higher prices. The U.S. imports roughly $500 billion in Chinese goods each year, and — combined with existing tariffs — these new penalties would cover half of all goods sent to the U.S. from China each year. The 10 percent tariff is scaled back from Trump’s initial plan, which was to impose 25 percent penalties on all of these imports. But the impact will still likely be felt by millions of American consumers, as it would apply to smartphones, computers and many other middle-class staples. A Trump administration spokesman didn’t immediately respond to a request for comment Saturday afternoon. Trump has accused China of a number of unfair trade practices, and he has threatened to impose tariffs on all Chinese imports if changes aren’t made. He wants China to buy more American products, open China to more U.S. investment and stop stealing U.S. intellectual property, among other things. The tariffs come as a number of top White House advisers have been trying to de-escalate tensions between Trump and Chinese leader Xi Jinping. Treasury Secretary Steven Mnuchin was planning to restart talks with Chinese leaders soon, but they have vowed to retaliate to any escalation of the trade battle between the two countries with punitive steps of their own, and Trump’s move could further push China to retaliate. The decision was first reported by The Wall Street Journal. Trump has tried to use tariffs as a way to penalize a number of countries this year, including Mexico, Japan, Canada and members of the European Union, hoping that the threat of driving up costs on their products will make them more open to his demands. The tactic has had mixed success. Trump first imposed tariffs on roughly $50 billion in Chinese products, and the list of products included mostly industrial equipment to not directly impact consumers. China responded by imposing tariffs on U.S. products like beef and soybeans, a response that spooked the U.S. agriculture industry and angered Trump and other administration officials. Trump responded this summer by ordering his advisers to come up with a list of $200 billion in other Chinese products to penalize, a package of products that includes many consumer products. Two weeks ago, he said he is preparing a third package of penalties on what he said would be $267 billion in additional items, a list that likely encompasses all remaining goods produced in China. “For the near term, this combination of tactics seems to signal that unless and until China comes to the table with significant actions on the issues the U.S. is hammering, the U.S. will keep tariff pressure going,” said Claire Reade, a former U.S. trade negotiator. “Talks without action won’t do the trick. The open question, of course, is how much action is enough and can China find a way to move that will be seen as being in its own interest, not kowtowing to the U.S. 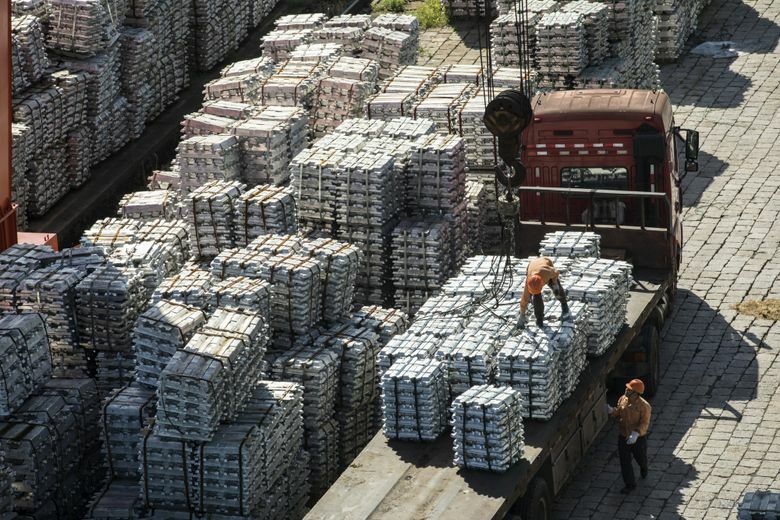 The U.S. ran a $233.5 billion deficit in goods trade with China during the first seven months of the year, an 8 percent increase compared with the same period in 2017.